Interior of Saint Julien's basilica, seen from the gallery of the narthex. One question that is commonly asked about Brioude is "How come it's not better known?" The answer is simple. Unless they are located close to big cities, or in particularly popular tourist areas, France's small towns are not well known – however interesting they may be. The best of France's small towns are for connaisseurs, and Brioude has a strong claim to be at or near the top of the list of interesting and attractive places to visit, for a day trip or for longer. The town's history goes back to Roman times, when "Brivas" was a small garrison guarding the crossing of the river Allier on the road from Augustonemetum (Clermont Ferrand) to Rouession (near Le Puy). The Roman garrison was located just south of the current town, at a point that is now the pretty village of Vieille Brioude – but nothing remains of the Roman site. Decorated 12th century romanesque apse of St. Julien's basilica. The new town of Brioude grew up from the 4th century onwards at the site of the shrine to Saint Julian. Julian - Julien in French - was a Roman centurion martyred for his Christian faith, and the shrine in which are preserved to this day some of his relics, is located in the crypt of Saint Julien's basilica the great historic pilgrimage church in the middle of Brioude. The original shrine of Saint Julien dates back to the 4th or 5th century, and by the end of the sixth century it was attracting pilgrims from all over France. By the ninth century, Brioude had become one of the five main cities of Auvergne. The shrine of Saint Julien was protected by an important monastery, among whose canons was Odilon de Mercoeur, a local man, who later went on to build the largest church in Christendom, the abbey church at Cluny in Burgundy. Brioude, the old town. 1. St Julien's Basilica. 2 Doyenné arts centre. 3. Lace museum. Orange circles: small art and craft galleries. In the 11th century, the original Gallo-Roman sanctuary was demolished to make way for a grand new basilica, the church which stands to this day; but while Saint Julien's shrine remained an important pilgrimage centre over the following centuries, the importance of Brioude as a town diminished. Most significantly, its relative decline was due to the fact that Brioude was not located on any main line of communication. Situated at the edge of a fertile plain - la petite Limagne - and surrounded by mountains on all sides except the north, Brioude was often cut off from the rest of France in winter. The area's medieval exports, wine and wood, all went north, floated down the river Allier to the Loire and on to Paris. Brioude was not even on the main medieval pilgrimage route to Compostella, which started from le Puy en Velay, further south; but the shrine of Saint Julien nevertheless brought pilgrims through the town on a less important Compostella pilgrimage route that ran down the valley of the river Allier. Though the arrival of a railway in 1857 brought Brioude much closer to the regional capital Clermont-Ferrand, and, from 1867, gave the town a new faster route across the Cevennes to the south, Brioude remained a small town, a local capital with its markets, its fairs, and its mainly agricultural economy. It is in part for this reason that Brioude's urban fabric, with its traditional architecture, was never disfigured by aggressive modernisation in the nineteenth and twentieth centuries. a) the fine twelfth-century apse, with delicate polychrome stonework and sculpted corbels on the outside. b) The remarkable 13th century frescoes, notably those in St. Michael's chapel, which are among the finest and best preserved frescoes of their time in France. c) The mosaics: small sections of mosaics from the Carolingian era (9th - 10th century) can be seen beside the main altar; but more interestingly, the whole nave floor is covered with a vast and unique 16th century mosaic made of coloured pebbles from the river Allier. d) The 12th century romanesque capitals, depicting scenes from life and from mythology. Some of these are clearly visible from St. Michael's chapel. e) Two unusual medieval polychrome statues, one showing Christ with leprosy, the other showing the Virgin Mary in labour. g) Contemporary stained-glass windows by Kim en Joong. The Deanery - Le Doyenné. Recently renovated 13th century building that was formerly the residence of the dean and chapter of the Basilica. The main room on the first floor contains a unique 13th century polychrome decorated ceiling, restored in 2017. The Doyenné is now a modern and contemporary arts centre. The renovated building reopened in 2018 with a major Chagall exhibition. For summer 2019, the Deanery will be hosting an important Miró exhibition, following on from the very successful 2018 Miro exhibition in the Grand Palais in Paris. The Lace-making centre. Hôtel de la dentelle. A small museum devoted to the art of lace-making. The Aquarium - A small aquarium presenting the fish and river-life of the Allier, once one of Europe's major salmon rivers. Salmon almost disappeared from the Allier in the 1960s, but are now making a slow comeback. Other sites : the narrow streets and small squares of the old town include many historic houses and other buildings dating from medieval times or later. Among these note the Maison de Mandrin, and the 12th century house, with arched windows, on the Place Eugène Gilbert. A plan is available from the Tourist Office. The Saturday market. Extensive weekly market, covering streets and squares in the centre of the old town. Farmers' market, local produce, fruit and vegetables, and a range of other stalls. Brioude - city of the arts. There are a number of small art and craft galleries in Brioude, including the Maison de Mandrin (exhibitions all year), the Mirandelle tearoom (watercolours) , Couleurs Dentelle (lace and objets d'art), and other small galleries. However it is essentially in the summer that Brioude comes to life as an art centre. The new Doyenné arts centre opened in 2018 with a Chagall exhibition, and the plan is to host a major exhibition of modern or contemporary art each year, from June to September. Every other year (mid July in odd-numbered years) Brioude is home to France's premier water-colour event, the Biennale de l'Aquarelle (website) , with watercolourists from around the world. There are a number of smaller exhibitions in Brioude and surrounding villages. Music : There is an extensive programme of musical events in and around Brioude in the summer months, with up to half a dozen concerts in St. Julien's basilica, and many more concerts in historic churches and other locations in the surrounding areas. See programme . Brioude also each year hosts a couple of concerts in the framework of the renowned La Chaise Dieu festival of classical music. Brioude is the centre for the beautiful Haut Allier area, a designated "art and history" heritage area covering the valleys of the Allier and tributaries. The area covers the valleys of the Allier, the Allagnon and the Senouire, including two "plus beaux villages de France", and many other and natural historic sites. The Haut Allier is remarkable in that in addition to being a historic heritage area, it is also a stunning natural heritage area, with unspoilt natural environments rich in wildilife, and an area with a rich historic and cultural heritage. The medieval churches and chapels of the Haut Allier, many of them with historic frescoes from the 12th to 15th centuries. Of particular note are the churches of Auzon, Saint Cirgues and Lavaudieu, which tend to be open every day during the summer months. Lavaudieu also has the finest romanesque cloisters in Auvergne, and a refectory with more rich medieval frescoes. The medieval castles, notably Paulhac, Léotoing, Domeyrat (visits and activities in summer), Saint Ilpize (free access all year). The château of Chaviniac Lafayette, former family seat of the Lafayettes - a must-see location for visitors from the United States. Lavoûte Chilhac, with its high fifteenth-century hump-backed bridge over the river Allier, and its fifteenth-century priory church, fronted by the unusual crescent-shaped facade of the eighteenth-century priory. Small ornithological centre. Ally, a village located at 1000m, with historic windmills, modern wind turbines, and a gallo-roman tin and antimony mine (underground visits throughout the summer). Chilhac, Christian Guth paleontological museum, suspension bridge over the Allier, and remarkable volcanic basalt organ rocks. The nearby Falaise du Blot is a remarkable geological site, and is one of the oldest sites of human habitation in Europe. Other interesting villages include Vieille Brioude, with a romanesque church, a small wine-making museum telling the story of the Haut-Allier's past as a vineyard area. Out-door activities The area round Brioude and the Haut-Allier has a dense network of marked hiking trails, cycling routes and mountain-biking circuits. there is also kayaking on the river Allier (several canoe/kayak hire locations - summer only). Ornithology - the Haut Allier is a noted bird-life area. The Allier gorge, south of Langeac, with very attractive villages at Chanteuges (romanesque abbey) and Saint Arcons, and dramatic basalt organ-rock formations at the village of Prades. Tourist train up the gorge in summer from Langeac; normal trains all year. La Chaise-Dieu : austere benedictine abbey situated at an altitude of 1000 metres. World-renowned "dance macabre" frescoes and historic tapestries. 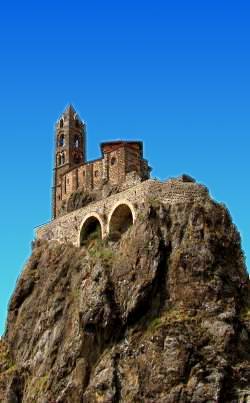 Le Puy en Velay - a historic city whose cathedral and chapel are part of a listed Unesco world heritage site. By air The nearest airport is Clermont Ferrand, served all year by flights from Paris and Amsterdam, and for a few months in summer by Ryanair from London Stansted. The nearest major airport is Lyon St.Exupéry ( 3 hrs drive), which has flights all over Europe. By car Brioude is 15 km from the A75 (Paris-) Clermont-Ferrand - Montpellier motorway. It is on the N102 linking the A75 with the A7 at Montelimar, via le Puy. It is under 3 hours from Lyon. Copyright © About-France.com 2007 - 2019 except where otherwise stated. Region: the Auvergne part of the Auvergne-Rhone-Alpes region. Main sites: St Julien's basilica, Doyenné arts centre, Lace-making museum . Nearby attractions and sites: The Haut-Allier, La Chaise Dieu, Le Puy en Velay, the Auvergne wildlife park. A very traditional French hotel, with good service and a well recommended restaurant. Modern three-star hotel close to the N102 at the northern approach to Brioude. Restaurant. Hotel in a village beside the N102 12 km south of Brioude. Good traditional restaurant.Pool . Close to the junction of the A75 motorway and the N102, 15 km north of Brioude. Free parking, restaurant. Upscale 3-star hotel in a former chateau, just off the N102 15 km south of Brioude. Restaurant, spa, pool, free parking. Listed with "relais du silence"
Brioude has plenty of restaurants for all tastes. Particularly recommended are the restaurants at the Hotel de la Poste, the Hotel la Sapinière, and the Pizzeria Saint Julien, just beside the Basilica. The town also has small gourmet restaurants, a Vietnamese restaurant and a MacDonalds. On the northern approach to the town there is an Intermarché and a large Carrefour Market. Close to the town centre, near the Aquarium, there is a Casino supermarket. The different options: hotels, gites, camping in France. Make the most of your trip to Paris; attractions, Paris hotels, transport, and lots more.